I’m saving the fun part for last, namely finishing the top of the back bodice (never thought I’d be so excited about increasing and decreasing), and the eventual finish to the argyle design with some back-stitching. The pattern asks for an embroidered chain, but I’m WAY too lazy ;)… seriously, when I tried it, due to the square nature of the holes, getting the perfect diagonal was IMPOSSIBLE… a back-stitch is much easier to beat into submission. heehee! 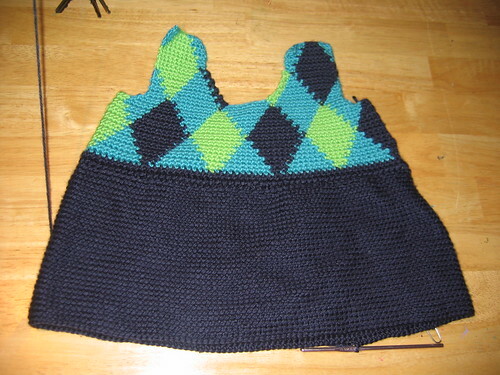 I do like the patterned top – it’s going to be so cute when it’s finished! I love what you’ve done so far, especially the colors. Very cute!